Route 4 serves central and northeast neighborhoods and connects them to Downtown. 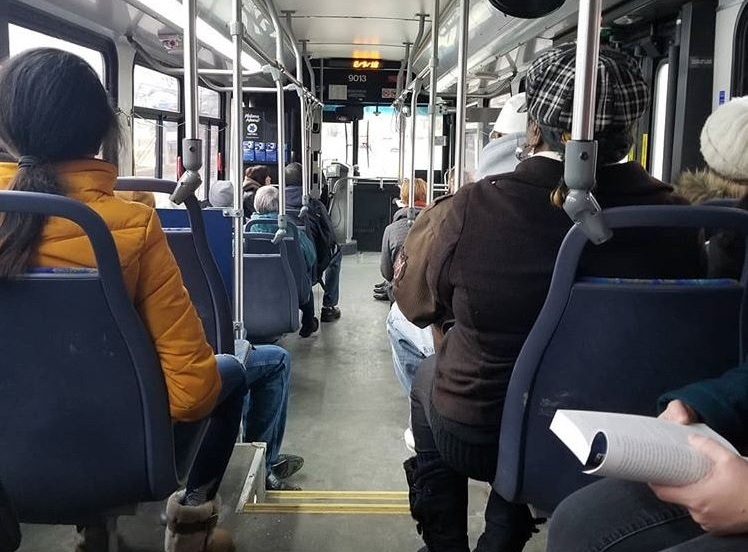 The 4th busiest route in the system, over 6,600 people board per weekday mostly along Gilbert Ave, Montgomery Rd, Ridge Rd, and Plainfield Rd. The route serves Cincinnati, Norwood, Silverton, Deer Park, Sycamore Twp, and Blue Ash. Major hubs include UC Blue Ash, the Kenwood Towne Center, Surrey Square in Norwood, Peeble's Corner in Walnut Hills, the Oakley Transit Center at Oakley Station, and Government Square. Route 11 serves Eastside neighborhoods and connects them to Downtown. The 5th busiest line in the system, over 4,200 people board per weekday mostly along Gilbert Ave, Woodburn Ave, Madison Rd, Erie Ave, Wasson Rd, Marburg Ave, Brotherton Rd, Bramble Ave, and Plainville Rd. The route is entirely inside the City of Cincinnati. Major hubs include the Oakley Transit Center at Oakley Station, Peeble's Corner in Walnut Hills, and Government Square. Route 17 serves central and northwest neighborhoods and connects them to Downtown and Uptown. The 2nd busiest line in the system, over 7,150 people board per weekday mostly along Hamilton Ave, Colerain Ave, Ludlow Ave, and Clifton Ave. The route serves Cincinnati, North College Hill, Mt. Healthy, Springfield Twp, Forest Park, and Colerain Twp. Major hubs include Northgate Mall, Seven Hills Shopping Center, Knowlton's Corner in Northside, and Government Square. Route 19 serves central and northwest neighborhoods and connects them to Downtown and Uptown. The 8th busiest line in the system, over 3,600 people board per weekday mostly along Colerain Ave, Blue Rock Rd, Ludlow Ave, Jefferson Ave, Corry St, and Auburn Ave. The route serves Cincinnati, Colerain Twp, and the northeast tip of Green Twp. Major hubs include Northgate Mall, Knowlton's Corner in Northside, UC/Jefferson, and Government Square. Route 21 serves Westside neighborhoods and connects them to Downtown. 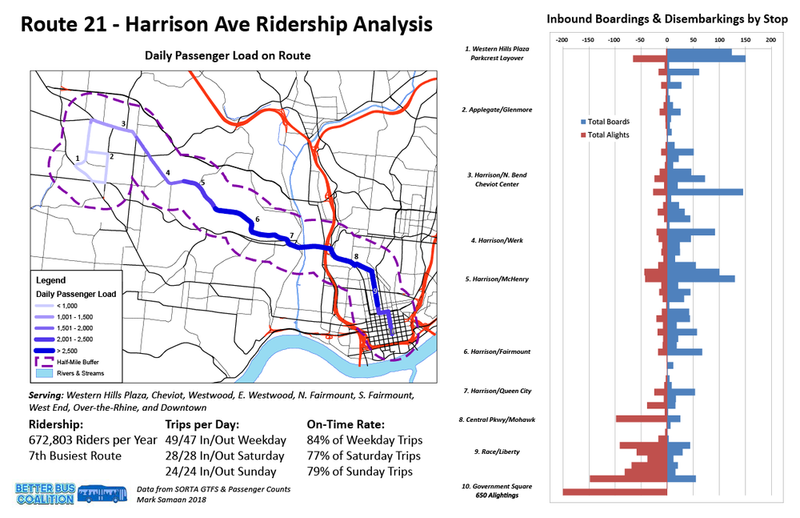 The 7th busiest line in the system, over 3,800 people board per weekday mostly along Harrison Ave, Queen City Blvd, Central Pkwy, McMicken Ave, and Race St. The route serves Cincinnati and Cheviot. Major hubs include Western Hill Plaza in Westwood and Government Square. Route 33 serves Westside neighborhoods and connects them to Downtown. The 3rd busiest line in the system, over 6,150 people board per weekday mostly along Glenway Ave, Boudinot Ave, Warsaw Ave, and 8th St. The route is entirely inside the City of Cincinnati. Major hubs include the Western Hills Plaza in Westwood, 8th and State in Lower Price Hill, and Government Square. Route 43 serves central neighborhoods and connects them to Uptown and Downtown. The busiest line in the system, over 9,700 people board per weekday mostly along Reading Rd, Mitchell Ave, Winton Rd, and Shepard Ave. The route serves Cincinnati, St. Bernard, Reading, Lockland, Evendale, and, Woodlawn. Major hubs include Midpointe Crossing in Bond Hill/Roselawn and Government Square. Route 51 connects Eastside and Westside neighborhoods via Uptown. The 10th busiest line in the system, over 3,100 people board per weekday mostly along Glenmore Ave, Montana Ave, Blue Rock Rd, Ludlow Ave, MLK Blvd, Burnet Ave, Dana Ave, Montgomery Rd, Smith Rd, Edwards Rd, Paxton Ave, and Ridge Rd. The route serves Cincinnati and Norwood. Major hubs include Glenway Crossing in Westwood, Knowlton's Corner in Northside, Surrey Square in Norwood, and Oakley Transit Center at Oakley Station. Route 64 serves Westside neighborhoods and connects them to Downtown. 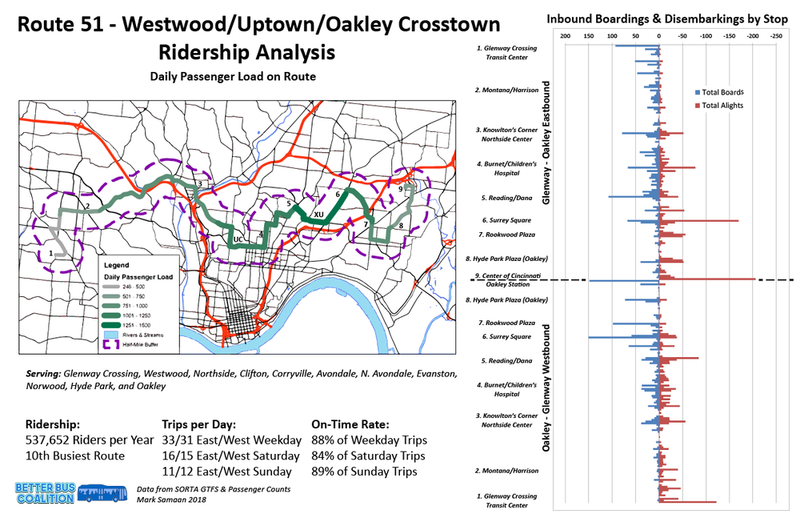 The 9th busiest line in the system, over 3,500 people board per weekday mostly along Glenway Ave, Ferguson Rd, Queen City Ave, LaFeuille Ter, Harrison Ave, McHenry Ave, Baltimore Ave, and McMicken Ave. Major hubs include Glenway Crossing in Westwood and Government Square. Route 78 serves central neighborhoods and connects them to Uptown and Downtown. The 6th busiest line in the system, over 4,500 people board per weekday mostly along Vine St, Springfield Pk, Wayne Ave, Paddock Rd, and Ross Ave. Major hubs include Tri-County Mall, Grueninger Way in Woodlawn, UC/Jefferson, and Government Square. A bus is considered "on-time" if it completes its route within 5 minutes of its scheduled time. Below are the recorded on-time performances for each local route. Mouse over each bar to see the exact percentage.